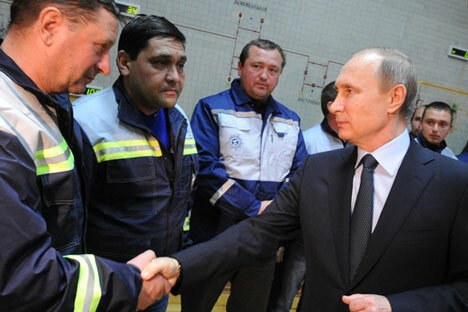 Russia's President Vladimir Putin (R) at the launching of the first stage of a power bridge from Russia to Crimea. Lights are partially back up in Crimea. An underwater cable linked the peninsula’s electricity system with a Russian electrical grid on December 2, partly restoring electricity in Crimea. Why were Russian authorities unprepared for the peninsula's electricity being cut off by Ukrainian activists? RIR asks whether the energy bridge will save residents of Crimea from future infrastructure failures. A link termed the “energy bridge,” running along the bottom of the Kerch Strait, was inaugurated on December 2. For Crimeans, it was a joyous occasion. They had been living without power since November 22, when Ukrainian activists sabotaged pylons carrying power lines to the peninsula from Ukraine’s Kherson Region. However, for many it still has largely symbolic significance. Crimea requires 500 MW of power capacity beyond the 500 MW it produces by itself. The ‘energy link’ provides 200 MW, since the first phase that was launched is working only at half-capacity. Many people are also worried about more subversive activities by Ukraine. Analysts believe that even if Crimea solves its urgent electricity problem, its water supply infrastructure will continue to remain vulnerable. In August last summer, many Crimean resorts experienced disastrous consequences when supplies of fresh water ran out. The Crimean electricity network was completely shut down in the early hours of November 22 after a group of Ukrainian and Crimean Tatar activists opposed to Russian rule in the region blew up electric power lines going from Ukraine to Ukraine, plunging the peninsula into darkness. In accordance with an agreement signed with Russia, Ukraine had been supplying up to 80 percent of all the energy consumed by Crimea. Surprisingly, considering the tensions between the two countries, the act of sabotage took the Crimean authorities by surprise. According to Russian Deputy Energy Minister Andrei Cherezov, out of the 94 supermarkets on the peninsula only 10 have autonomous power supply sources. The situation with the water is much more complicated. Yes, for now water continues to be supplied from Ukraine, but if the supply were to be cut off, Moscow would be able to provide only temporary solutions. Crimea consumes about two billion cubic meters of water a year, out of which 80 percent is used for agriculture. In normal natural conditions Ukraine provided one billion cubic meters of water along the North Crimean Canal and the rest flowed into reservoirs from local wells and runoffs. However, if the reservoirs for some reason were not filled up, then 85 percent of all water consumed on the peninsula came from Ukraine. In this respect, Crimea is particularly vulnerable: If water supplies to Ukraine are also sabotaged (and the subject of various potential “blockades” – banking, maritime, etc – against Crimea is being discussed in Ukrainian media), then the peninsula would be facing serious problems. Creating its own water intakes will not solve the problem. According to Crimean Ecology and Wildlife Minister Gennady Narayev, three new intakes, which will be built by the end of the year, will produce a total of only 195,000 cubic meters daily. The modernization of Crimea's water supply infrastructure (74.4 percent of which was in need of repair by 2013, and whose water supply networks lose 20-25 percent of the water) will also not help Crimea in the event of water supplies from Ukraine being severed.